Oops! Turns out that this chart–while it may make sense and even hold some truth–is not based on any real research. Thanks to alert reader, Ian, who let me know. Take a careful look at this graphic (click on it for a higher resolution view), and use the power of the pyramid to beef up your studies. You can see that 24 hours after a lecture students recall only about 5% of what they heard, but by teaching others what you are learning you will recall an average of 90% of the material! Gee. Seems like I talked about teaching to learn in a previous post. It stinks that most college classes are mainly lecture, but you can push that recall further down the pyramid by taking effective notes and reacting to the information instead of just passively capturing it. Don’t sell this information short; this is golden! Think; if you normally study by reading your notes, according to this graph, you’ll recall approximately 10 percent of the material 24 hours later. Teach that same material to someone else and you will recall nine times as much 24 hours later! Imagine how much time and effort that will save you. Start studying this way today. Look here for more information on using this method. 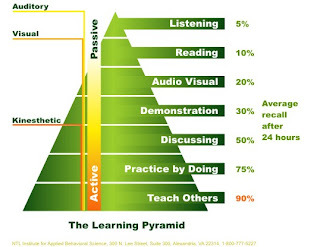 I just happened to stumble across this page with the learning pyramid. It happens that I’ve been doing a lot of digging into this thing (because it looked bogus to me), and there turns out to be no research base for it. Somebody just made it up. I tracked it down to National Training Laboratories in Bethel, Maine and was told by someone there that it was developed there, but that there was no empirical research supporting it. Rather, it was based on “plausibility” and just seemed to make sense. Just thought I should pass that information on!